Making your way in the world today takes everything you've got. So sometimes you want to go where everybody knows your name. But let's be honest, Broken Moments ain't Cheers. Set at the titular bar, the show is about the staff and regulars paying respects to the deceased owner. And yet these people are so wrapped in their own personal lives that respect paying rarely happens. With songs coming at random and plot lines and resolutions that are nothing short of silly, Broken Moments is a broken musical. Written by Leo I. Rodriguez, who also plays a big role as head barkeep Leo, could use great assistance in fixing the story. Firstly, if the focus is on the people of the bar, Rodriguez could easily eliminate five characters that do literally nothing to the primary plot. The brothers and the bridal party do not further the plot aside from displaying the randos that wander into the bar. If you took them out and tweaked one song moment, the same story exists and twenty minutes of fluff are long gone. Secondly, the character of Nikki is just unlikable. It's introduced and believed that she and Eddie, the deceased owner, were an item. As a coincidental device is introduced, the man reading the will happens to be Nikki's husband. The timeline that Rodriguez provides states that Nikki has been a regular at the bar for close to six years. Within these six years she has kept up a charade where she has lied to the people of the bar and her husband. Yet the characters, including the slightly fey husband Robert, brush it under the rug as if it's all good. Or maybe it's just the booze talking. The libretto Rodriguez provides is quite weak, especially when it comes to transitions and song set ups. The thematic and topical jumps are so grand they come off as hokey and hilarious. The music Rodriguez brings to the bar range from pop rock to blues. None of the songs particularly stand out but one of the most worrisome things about the score is the inability to sing the title. 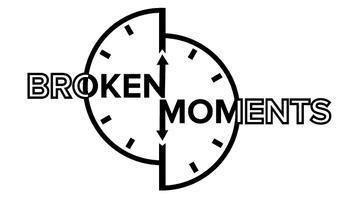 In the song “Broken Moments”, the word “Broken” is sung so fast that it’s barely recognizable. It gets repeated so often that some of the actors have trouble keeping up. I’m sure it would be hard to change the name of the bar at this point, but the name does cause issues. And it’s not really an enticing name of a drinking establishment anyway. The dive bar is filled with a large array of drinkers and servers. So much so, you’d think it would be hard to stick out in the bunch. The company of Broken Moments featured some incredible vocal talents as well as some that stumbled in the acting category. The strongest overall performer was Benjamin Horen as barback Adam. Horen has a rockstar persona with a voice to match. Emily Battles as the resident floosy took on the constant drunk role well. It’s unfortunate that Rodriguez barely gave her anything else to do. Katherine E. Sulenski’s Nikki was a doomed character when we discovered her secret. With her constant outbursts and woe-is-me demeanor, it was impossible to care for the character. Rodriguez put a spotlight on this character and allowed Sulenski to have many musical moments. Unfortunately, she was not one of the stronger singers in the bunch. Some of those were relegated to party girls. Elizabeth Pryce Davies as Christa, the pregnant waitress and lady of Adam, offered little personality in her acting. She was quite stoic. But when she sang, she dazzled. The notes that Davies hit reached the rafters. Broken Moments got incredibly lucky by receiving a venue that happened to be a bar. Unlike other productions in the space, the audience flipped around and used DROM’s actual bar turning the musical into a site specific piece. Director Steve Velardi did not treat it as such. Velardi encountered many problems with Rodriguez’s script and yet tacked on even more. Velardi’s staging and choreography was problematic by not utilizing the actual confines of the space. All bathrooms are stage left, make the actors go stage left if they say they are using the restroom. Placing the brothers table so close to the audience not only made it incredibly intimate, it caused their stage silences to be mighty awkward. The reality of Rodriguez’s script was already a bit wonky with characters disappearing to smoke or pee for lengthy amounts of time just to ensure intimate moments. But the rules of Broken Moments were as incoherent as some of the customers. Velardi, Rodriguez and arranger Ben Harrell allowed random characters to take part in numbers they had no business being a part of just to add some snazzy moves or extra voices. You must be able to suspend your disbelief but sometimes it pushed the boundaries a little too far. Broken Moments celebrates love and family. It’s evident that this musical has grown a family. But sometimes there needs to be a little tough love. And in order for Broken Moments to thrive, some tough love with the material, and subsequently the characters, is crucial.